Scarlett has had her g-tube for nearly a month now. We have all adjusted to it pretty easily, though it has posed some new challenges for both her and us. Here's a run-down of g-tube life for Scarlett. The top part sits right on her stomach. The balloon is in her stomach, and is inflated with water from the little side port on the right. The top just pops closed, very similar to an inflatable pool toy. Her abdominal wall and stomach are in the process of healing into a tract (or stoma) that will stay open for a while even if the tube is removed - much like a piercing. 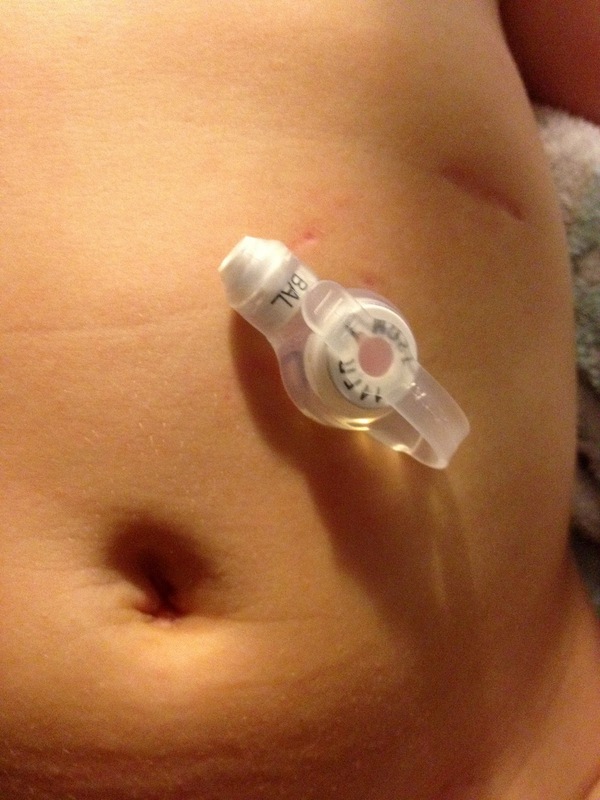 When she no longer needs the tube, it can be removed, and the stoma will heal itself. A lot of people ask us if it leaks. It doesn't really; yes, some drips of stomach fluid ooze out through the stoma, but we use gauze around it to absorb anything. It's not messy at all. 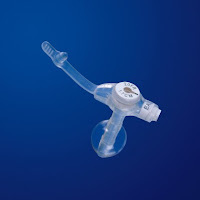 To use it, we attach an extension tube into the top, which attaches to a syringe of formula. The formula goes straight into her stomach, followed by a little water, and then we close the top. Not so great: Having the g-tube has made Scarlett even less fond of tummy time. She pretty much just lays her head down and whimpers. We're working on it in therapy, but she's just not quite able to hold herself off her stomach yet. They tell us it doesn't hurt (and it doesn't seem to) but she is very easily deterred from doing anything she finds unpleasant. Another challenge has been dressing her. The tube it just above the waistline of most of her pants, but thick waistbands, like on jeans, rub against it when she sits up. We need easy access at least 4 times a day, so one-piece outfits are a hassle. However, since she is still spending most of her time on the floor or being carried, onesies are still the most practical. So, in my crafty-momma way, I found some solutions. For those onesies that had cute pictures on them, I cut the snaps off and hemmed them to make t-shirts. Since I usually dress her in layers, all the plain onesies are getting a different treatment: I am in the processes of adding welt pockets to anything that snaps or zips (using a pattern I found at Adapting Creatively). It works particularly well on BabyGap's Bodydoubles that have an attached t-shirt so that it is covered. This has been the neatest-looking, most accessible solution so far. We tried a few Tummy Tunnels, iron-on patches with holes in the center for g-tube access, but they aren't working as well for us. The hardest part is really the most obvious: it's still a tube. It's still a really abnormal way to feed a baby, and it feels very strange to hook a tube up her whether she wants to or not (she still doesn't really indicate hunger, so we just have a set schedule). With chemo over, I am anxious to see the normal life begin, and this is the most abnormal thing we have. I see my friends battle their toddlers to eat, and I will admit there is a little part of me that likes to be able to feed her on a schedule, knowing she is getting all the nutrients, minerals, calories and water she needs...I just wish it wasn't by tube. That sounds way better than the ng tube. How long will she have this new tube? When can she try to eat via mouth? So happy with her progress! I work with a 6 year old girl who still has a g-tube. When she was younger her mother used to dress her in overalls most of the time because they allowed for easier access to the tube without rubbing against it. Hope this information helps you. You and your family are always in my prayers. Good luck. I don't know if you know about this lady who make stuff for g-tubes. Just thought I'd pass it along. I am a home health nurse that works with babies up to children and teens and adults with different types of G and J-tubes. To help her adjust to tummy time, introduce the boppy again, it'll lift her up a bit and try her on her side too, so she's not directly on that button. It may be a little uncomfortable where the stoma is developing because right now it's kind of raw skin and the rubbing/pushing may be tender a little, or just unknown to her and new. I'm sure she'll adjust fast and it'll be a nice, easy way for you all to live your lives! I think you will really grow to like the mickey-button. I used to work as a pediatric home health RN and it was my favorite form of the f-tube! I hope it starts to seem more normal for you! Your beautiful little girl and family are so inspiring! i can tell you that the reluctance to be on her tummy will pass! when my sweet frankie got his, he spent the first several weeks being very guarded about his tummy area, but now? he crawls off of furniture, climbs on everything and doesnt even notice the thing!! as for clothing,find someone to put a "buttonhole" on the sides of her dresses with their sewing machine, or just cut a small slit. my little guy just refuses to eat..he is deaf, very delayed and cannot figure out the chewing process. I feel your pain! I still can't believe she spent that long on the NG tube. We've had a g-tube for over a year now. I have to say that I'm still not used to (or happy) that we have to feed by a tube. However, I'm glad we have the medical technology. Can you imagine the horror if we couldn't feed our little ones this way? I second another poster's link to Tubie Whoobies - after about 2 months of gauze, we were thrilled to switch to a washable pad. I like one piece button down outfits for easy feed access and keeping it away from curious hands. But, that's hard the bigger they get (try L'oved baby clothes). My little one got over the hatred of tummy time eventually and now doesn't even notice the g-tube (even when I pulled it out this weekend). Good luck on this newest adventure - we're all behind you! My son was on a G tube for 9 months. He is about 2 1/2 and still has some weakness in his core, ie its harder to just sit up from lying on his back. besides that he is fine :) i highly recommend mybuttonbuddies.com if you are using anything for leakage. sooooo much better then gauze. we had my son in a lot of button down onesies and then t shirts later. also we only bought button down pajamas. the tube is never something we want but it was so helpful in getting my son the nutrients that he needed until his second jaw surgery. good luck with everything! !